American earth magnetosphere satellite. FAST was designed to observe and measure rapidly varying electric and magnetic fields and the flow of electrons and ions above the aurora. Research satellite built by NASA Goddard Space Flight Center for NASA, USA. Launched 1996. AKA: Fast Auroral Snapshot Explorer. Status: Operational 1996. First Launch: 1996-08-21. Last Launch: 1996-08-21. Number: 1 . Gross mass: 191 kg (421 lb). Height: 1.80 m (5.90 ft). FAST would correlate measurements of electrical and magnetic fields from other sensors and simultaneously correlate these forces with their effects on electrons and ions at altitudes of 350 to 4200 km. These observations would be complemented by data from other spacecraft at higher altitudes, which would be observing fields and particles and photographing the aurora from above, thus placing FAST observations in global context. At the same time, auroral observatories and geomagnetic stations on the ground would provide measurements on how the energetic processes FAST observes affect the Earth. Although prepared for mid-1994 launch date, FAST was placed into storage until a series of problems with the Pegasus launch vehicle could be corrected. The vehicle was finally placed into orbit on 21 August 1996. The spacecraft was spin stabilized (12 rpm), keeping the spin axis aligned with orbit-normal, and powered by body mounted GaAs solar cells. It has an aluminum structure and the control computer used dual 80C85 rad hard processors. An S-Band transponder was used for command and telemetry. Passive thermal control. Electric Field Experiment, used 3 orthogonal boom pairs to measure plasma density and electron temperature. Magnetic Field Experiment, had 2 magnetometers 180 deg apart deployed on graphite booms. Time-of-Flight Energy Angle Mass Spectrograph (TEAMS), a mass-resolving spectrometer designed to measure 3-dimension distribution functions of major ion species. Sixteen Electrostatic Analyzers (ESA) were used for electron and ion measurements from 3 eV to 30 KeV. Total mission cost was $ 60 million mission: $ 27 million for the satellite + $ 18 million for the instruments + $ 15 million for the launch. The Fast Auroral SnapshoT Explorer (FAST) was successfully launched on 1996-08-21 into its intended orbit. FAST investigates the plasma physics of auroral phenomena at extremely high time and spatial resolution using the full complement of particle and fields instruments. FAST is the second spacecraft (SAMPEX was first) in the Small Explorer (SMEX) program at NASA-GSFC. SMEX was established to provide rapid (3 year development) low cost ($35M development) mission opportunities (1 per year) to the space science community using a single designated Principal Investigator (PI). In order to capture the auroral phenomena over small time (microseconds) and spatial scales, FAST utilizes high speed data sampling, a large, fast-loading ("burst") memory, and a smart, on-board software to trigger on the appearance of various key phenomena. Using a 1 Gb solid-state memory and a data acquisition rate of 8 Mbs (almost two orders of magnitude faster than previous satellites), FAST produces high-resolution "snapshots" of auroral arcs and other interesting auroral events. FAST flies in a highly eccentric, near-polar orbit precessing nominally one degree per day. Scientific investigations are operate in a campaign mode (about 60 days long) as apogee transitions through the northern auroral zone and in less intense survey mode during the rest of the orbit. The FAST mission uses a unique (not a SAMPEX derivative), lightweight, orbit-normal spinner spacecraft developed by the SMEX project. 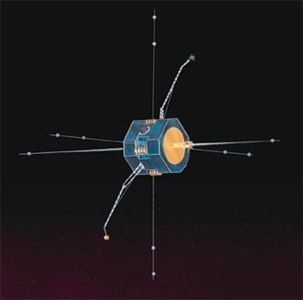 The spacecraft has body-mounted solar arrays, and is spin-stabilized, rotating at 12 rpm with the spin axis normal to the orbit plane ("cartwheel"). The four FAST experiments are: (1) the Electrostatic Analyzers (ESA) for measuring the electron and ion distribution function, (2) the Time-of-flight Energy Angle Mass Spectrograph (TEAMS) for measuring the full 3-dimensional distribution function of the major ion species, (3) the Tri-Axial Fluxgate and Search-coil Magnetometers for measuring magnetic field data, and (4) the Electric Field/Langmuir Probe Instrument for obtaining electric field data and plasma density and temperature. The FAST electric field instrument stopped providing meaningful data around 2002, all other instruments and systems continue to function nominally. FAST operations ended on May 4, 2009. Family: Earth, Magnetosphere sat. Country: USA. Launch Vehicles: Pegasus, Pegasus XL. Projects: Small Explorer. Launch Sites: Point Arguello WADZ. Agency: NASA, NASA Greenbelt. Bibliography: 2, 4, 6494, 12379. 1996 August 21 - . 09:47 GMT - . Launch Site: Point Arguello. Launch Complex: Point Arguello WADZ. Launch Pad: Aircraft from Vandenberg.. Launch Platform: L-1011. LV Family: Pegasus. Launch Vehicle: Pegasus XL. FAST - . Nation: USA. Agency: NASA Greenbelt. Program: Small Explorer. Class: Earth. Type: Magnetosphere satellite. Spacecraft: FAST. USAF Sat Cat: 24285 . COSPAR: 1996-049A. Apogee: 4,163 km (2,586 mi). Perigee: 353 km (219 mi). Inclination: 83.00 deg. Period: 132.70 min. Second Small Explorer mission. Air dropped in Point Arguello WADZ..